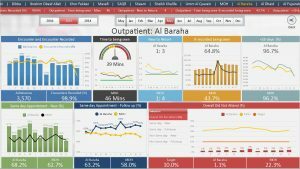 One of the most awe-inspiring presentations at this year’s IBIS conference was about how a government ministry is driving improved healthcare for its citizens by analyzing and visualizing data and then acting on the results. Isn’t this what Business Intelligence is all about? Analyzing and visualizing data and then taking action based on the results? So why do so many other organizations appear to struggle with this? Well maybe we could all learn from Dr. Kalthoom Mohammad, Director of the Hospital Department in the UAE Ministry of Health and Prevention (MOHAP) Hospitals Sector, and her colleagues who spearheaded this project. Firstly, The United Arab Emirates (UAE) has a vision to become among the best countries in the world by 2021. While this may sound like a lofty goal, the vision, aptly named Vision 2021, comes from the top and encompasses all aspects of life in the UAE uniting people in responsibility, destiny, knowledge and prosperity. The country even has a Minister of Happiness. To be amongst the best countries in the world you need to have world class healthcare as the UAE believes that success requires an open mind and a healthy body. So, right away, MOHAP had both a vision and executive sponsorship to support that vision. Secondly, MOHAP focused on 3 key pillars for service delivery for its many hospitals around the country, namely Quality, Efficiency and Patients and Staff with the strategy focused on patients, their safety, needs and satisfaction as well as attracting, retaining and supporting outstanding staff. They needed to identify the most important performance indicators to measure that pertained to the patient’s journey through the hospital system. 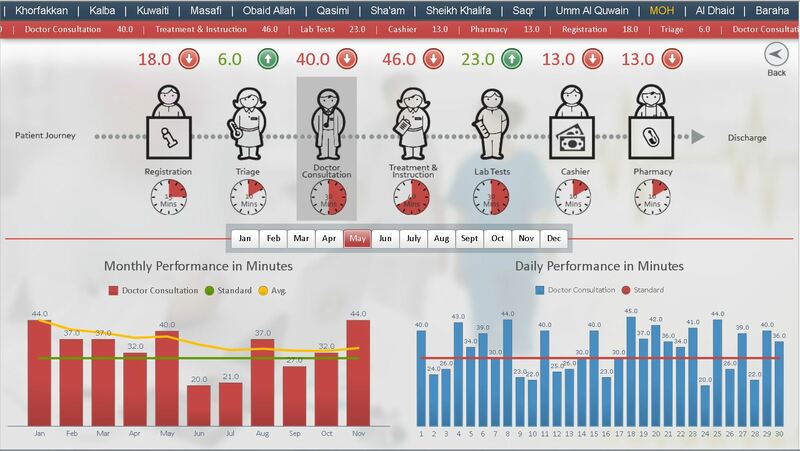 They ended up identifying 151 Key Performance Indicators (KPI’s) that covered overall activity, use of the facilities, interaction with care providers, quality of care and patient satisfaction. 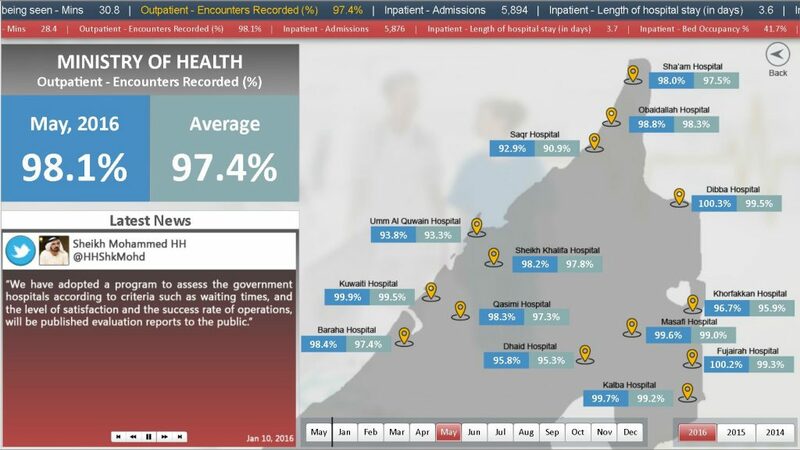 These KPI’s also had to be simple to understand, used by other healthcare providers, measurable with the data they had in their systems and relevant to the Ministry of Health. So, MOHAP drove this exercise from the practitioners themselves. This was not I.T. driven although I.T. had an important role to play in providing the data from their Cerner Millennium health information system and other systems to be modeled for analysis and visualization. 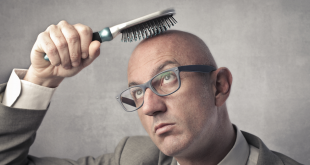 The best BI solutions are designed and built by the users themselves. By the end of 2012, MOHAP had 14 hospitals reporting on the main indicators for Inpatient, Outpatient and Emergency departments – nursing was added shortly afterwards. They were quickly able to identify a few areas where parts of the patient journey could be improved. However the process was manual and not automated and they were not able to see the whole picture clearly. It was at this time in 2015 that they embarked on a full Business Intelligence Data Warehouse and Dashboard project. 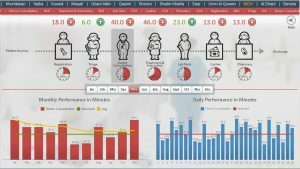 The first prototype dashboard built with SAP BusinessObjects Dashboards (Xcelsius) and using the in-memory caching of InfoBurst Dash was quite stunning in both functionality and visuals. 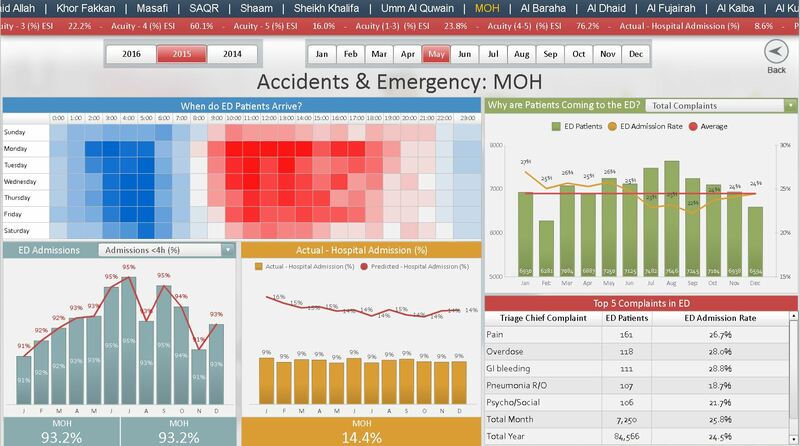 This dashboard won the Most Valuable Dashboard Award at IBIS. 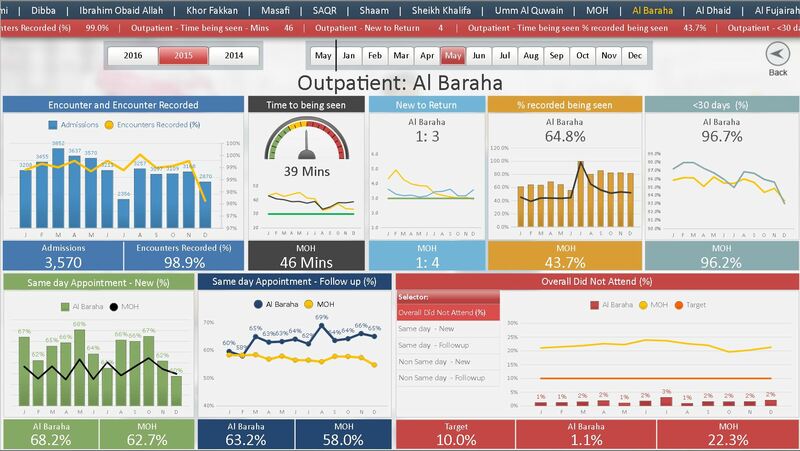 The second iteration which added much more comparative capability between the hospitals and which Dr. Kalthoom showed in her presentation simply blew me away as it did a good many other people when it was launched at Arab Health 2016 in Dubai earlier this year. 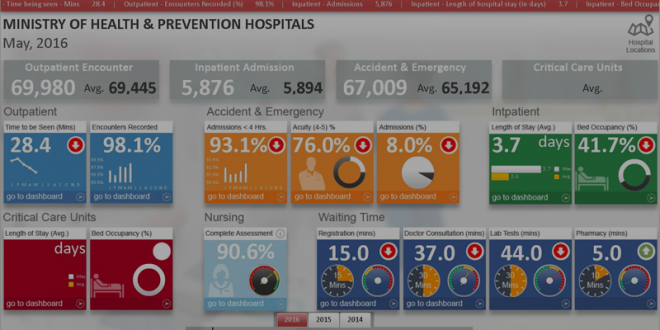 The dashboard shows the main KPI’s for all of the hospitals together then allows you to drill down to each individual hospital and to each department in the hospital. It also graphically shows the patient journey so that the average time for each stage can be clearly seen and compared over time. So MOHAP selected a Business Intelligence partner with a proven track record, Intellytics, who helped them to prototype and visualize their data analysis very quickly using tools that are both user friendly and versatile. There is a lot more to this story but it certainly stands out as a truly remarkable Business Intelligence case study that has already made a measurable difference in people’s lives and will continue to do so in the coming years.